WASHINGTON, D.C. -- More than a decade after the 9/11 terror attacks, Americans rank international terrorism as the greatest threat to the U.S. in the next 10 years, along with Iran's development of nuclear weapons. Majorities also perceive Islamic fundamentalism, the conflict between North and South Korea, and China's economic power as critical threats. Fewer Americans see Russia's military power as a critical threat to the U.S. in the coming decade. Americans are less likely this year than last to perceive the development of Iranian nuclear weapons as the greatest threat to the U.S. in the next decade, with the percentage falling from 83% last year to 76%, tying terrorism. This might be partly attributable to the ongoing nuclear talks between the U.S., Iran, and several other nations over the last several months. Russia's military power is viewed as less of a threat, though the belief that it is a critical threat has been rising over the past decade. Americans are nearly twice as likely to view Russia's military power as a critical threat now (32%) as they were 10 years ago, when 18% of Americans said Russian military power was a critical threat, 50% said it was important but not critical, and 29% said it was not important. A clear majority of Americans have consistently viewed international terrorism as a critical threat since Gallup began asking this question 10 years ago, although slightly fewer perceive this today. This comes nearly a year after the terror attack in Boston and as questions remain about the 2012 attack on a U.S. consulate in Benghazi, Libya. Over the past decade, the perceived threat of Islamic fundamentalism to American interests has risen. Now, 57% of Americans believe Islamic fundamentalism is a critical threat to vital U.S. interests in the next 10 years, up four percentage points from last year and six points from 2004. In light of ongoing Israeli-Palestinian negotiations for a peace framework, and amid Secretary of State John Kerry's frequent trips to the region, less than half of Americans (46%) believe the Israeli-Palestinian conflict will be a critical threat to U.S. interests in the next decade. This belief has been steady in recent polls, but is down from 58% in 2004. 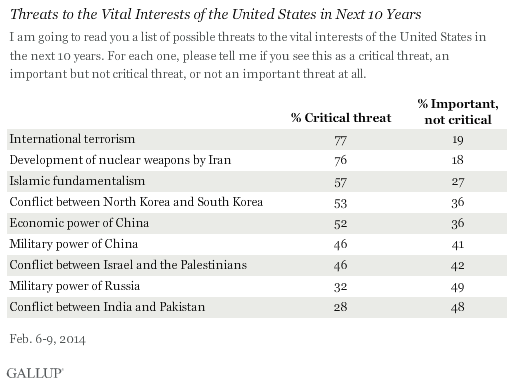 About as many Americans believe this is a critical threat as say it is an important but not critical one. Predicting the future is always difficult. Unforeseen crises often occur, while feared, expected events often never materialize. In geopolitical terms, Americans have remained relatively consistent in what they believe could constitute a critical threat to the U.S. in the next 10 years -- nuclear weapons or terrorism from abroad. International terrorism, which has manifested itself worldwide from time to time in the new millennium, has always ranked near the top of the list of perceived threats, even though no major international terrorist attacks have occurred in the U.S. since 9/11. There has been a seven-point drop this year in Americans' belief that the development of nuclear weapons by Iran will pose a threat to vital U.S. interests, and it remains to be seen whether that percentage will continue to drop if the nuclear peace talks between the U.S., Iran, Britain, France, Russia, China, and Germany are successful.